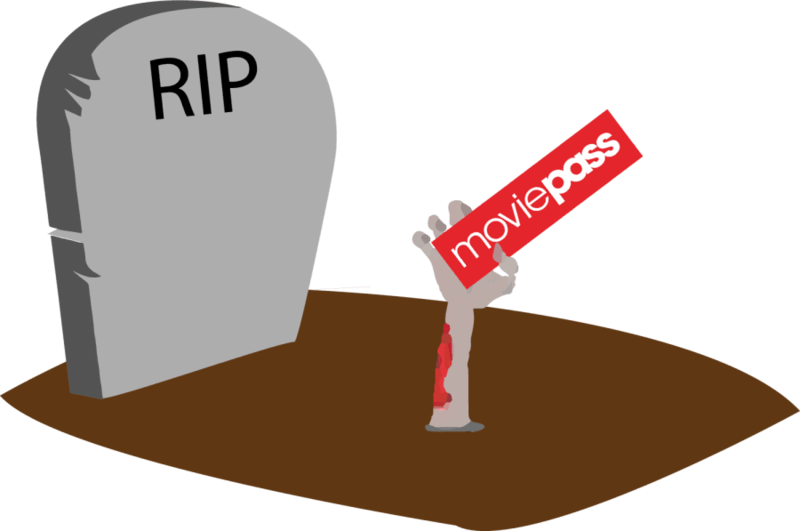 MoviePass, age 7, may have finally escaped this mortal realm this month following an approximately year-long battle with its user base. The proverbial final nail in the coffin for the movie theater subscription service may have come this month with news of customers being unknowingly re-enrolled in the program— the latest in a long string of customer service issues. Much of MoviePass’ life has been defined by the likelihood of its inevitable death. First arriving on the marketplace in 2011, the service has been called ‘too good to be true’ for a reason. Paying just $9.95 a month would allow subscribers to see unlimited movies each month, one movie per day. Subscribers could potentially see more than $300 worth of movies for less than the price of a single ticket at AMC, all the while MoviePass themselves would be paying that bill. The service has been incredibly popular, exceeding three million paying subscribers this June. At that time, MoviePass estimated that they would reach five million subscribers by the end of 2018. When MoviePass came onto the market, the program seemed to offer a chance for some students and other people who struggle to afford today’s movie-going scene a chance to see many additional movies each month. Joey Traverso, a senior in the CDM Directing program, was asked by the DePaulia last September about MoviePass. While he expressed hesitancy, especially given the friction between the company and theatre chain AMC, he did eventually buy into the program for about nine months. The last year of MoviePass has been plagued with financial difficulties, most notably this July when customers were blocked from seeing the newest “Mission: Impossible” film due to the company not having enough money to pay for any more tickets. Since the incident, MoviePass has buckled on its original unlimited-movies promise, only allowing customers to see three movies for free a month. What’s caused even more frustration from the user base is that the company now chooses the up to six movies that customers can choose from. MoviePass made news lately that it had taken in a $65 million more dollars in funding, although this did little to calm nervous inverters and more-so raised concerns about where the money had come from. MoviePass says this funding was from prepayments of an existing investor who they have yet to name. The company has also come under fire for what people saw as shady business practices, with MoviePass this month sending customers an email requiring them to opt-out of enrollment or be risked being charged for another month. MoviePass says that this was only for a select-group of customers. “To be clear, unless you opt out, your unlimited subscription will be restored and you will begin enjoying unlimited movies again,” read the email. Flores also notes that services like MoviePass don’t only give consumers a cheaper option for going to the cinema, they also give extra incentive to see stranger, more independent films that they wouldn’t otherwise want to spend extra money to see on the big screen. The vast popularity that MoviePass attained over the last half-decade has clearly been noticed, and now a number of other subscription-based theater programs are fighting for the crown. The AMC Stubs A-List program, which allows customers to see three movies of any format (IMAX and 3D included— something MoviePass lacked) for $19.99 per month, has attained 400,000 subscribers in the 14 months since it hit the market. MoviePass is survived by substantially less than the five million subscribers it was hoping it’d achieve this year.